You can't keep a good club down. Berkeley Patients Group writes on its website that it has reopened today, December 19, at 2366 San Pablo Ave. in Berkeley. In an email this morning to Group members, the club announced hours from 9 a.m. to 9 p.m. at its new storefront. U.S. Attorney Melinda Haag shut down Berkeley Patients Group's original storefront location at 2747 San Pablo Ave. in May of this year, signifying a then-high point of the now-fourteen month-long federal crackdown on California medical marijuana businesses. Oakland (and the country) is bleeding from gun violence. Aren't you stoked that US Attorney Melinda Haag is spending scarce resources fighting a state-legal anti-nausea botanical for cancer patients? We aren't. The legal maneuvers continue this week in the US government's forfeiture case against Harborside Health Center's dispensary in Oakland, and its second location in San Jose. Representatives from Harborside are scheduled to appear at 10 a.m. Thursday in US District Court, Courtroom D, 450 Golden Gate Avenue, San Francisco. The court will hear three motions: two from Harborside's landlords asking the feds to make the club stop selling pot, and one from the City of Oakland asking the feds to stay those motions while it fights the federal government's forfeiture action. Drug War Facts: How Many Stoners Are There in America? The answer: about 5 million. According to the 2011 National Survey on Drug Use and Health, "nearly 5.0 million persons used marijuana on a daily or almost daily basis over a 12-month period." Afer you've got done reading our fine analysis on the Colorado and Washington wins (click here), as well as our forecast for legalization in California, read our best Bud Lit of 2012 picks (click here). But after that go check out the e-book, which in addition to a large, previously unpublished section on the CO and WA legalization initiatives, also collects Bienenstock's best feature writing from High Times for the past ten years. Which is nice. Denver Westword's William Breathes points us this morning to a fabulous illustration of dumb TV media bias against people who smoke pot. A Fox News affiliate in Colorado subjected three stoned drivers to a simulator to videotape how they did. The catch: the simulator simulated driving an 18-wheel truck, and the testers rigged it for crashes. When Fox News got the simulated "collisions" they were looking for, we hear "Cut!" Turnabout is fair play, though. One of the medical marijuana patients, Max Montrosee, recorded the entire Fox News shoot to show how he was unfavorably edited. 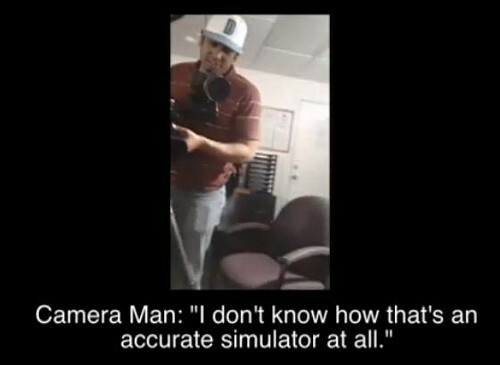 He also catches the Fox News cameraman admiting that the simulator was a setup. Bottom line: No one should drive under the influence of anything, ever. But if driving under the influence of the active ingredient in pot, THC, is such a heinous danger, then why has it been FDA-approved for decades under prescription Marinol? And how come no one seems to recall this? "Patients receiving treatment with MARINOL® Capsules should be specifically warned not to drive, operate machinery, or engage in any hazardous activity until it is established that they are able to tolerate the drug and to perform such tasks safely," the FDA states. We can look forward to more rigged dope studies in the time to come. Are stoners ready to be a model minority? They better be, because now that pot legalization passed in two states, any two-cent story with a weed connection has national legs. Over the weekend, it was the case of one bar owner in Washington who said he would — stop the presses — allow people to smoke pot on the premises. SHOCK! Horror! Screw it: Let's play a game of West Coast stereotype bingo, and see how many the Times can cram into this one. Here we go! Al Madrigal investigating "medical marijuana's effects on America's most vulnerable, Jazzy-riding citizens," and messing with Prop 19 foe, and self-appointed Sacramento Bishop Ron Allen. "the police department believes that, under state law, you may responsibly get baked, order some pizzas and enjoy a Lord of the Rings marathon in the privacy of your own home, if you want to. ... The Dude abides, and says “take it inside!”"